Dominick is an Assistant Professor of English at Winston-Salem State University and an MBA Candidate at Wake Forest University. He has held prestigious fellowships at the University of Hartford, the Andrew W. Mellon Foundation, and the University of Pennsylvania. He completed his Ph.D. in English from Emory University where he served as a multiple award-winning instructor of Emory’s Men Stopping Violence Initiative. This was a community-engaged learning course, internship, and social enterprise venture which challenged undergraduates to interrogate male intimate partner violence against women from practical and theoretical perspectives. 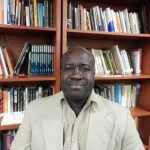 His interests include twentieth-century African Diasporic literature, online education, entrepreneurship, strategy, organizational behavior, and higher education leadership. Dominick is a member of the 2017 Class of RecruitMilitary Top 40 under 40 Military Veterans. A U.S. Navy veteran, Dominick served onboard the USS Harry S. Truman (CVN-75) as a radar technician. He is also a former regional veteran peer support specialist for the Virginia Veteran and Family Support program (VVFS), and a former youth counselor for the City of Charlottesville, VA from 2008-2010.